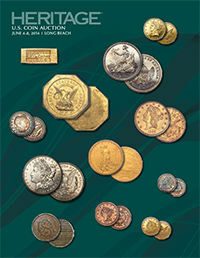 This week’s Long Beach Expo should be a very active event, especially with the metals hitting recent lows. Gold prices have not been this low since February and buyers will look to take advantage. 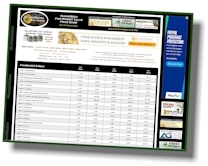 The one ounce Proof Gold Eagle is currently trading at $1,445 among dealers as long as it has the OGP. Proof Silver Eagles are $51 each. Silver bags have retreated to $14,240, while Silver Dollars are in strong demand at $28,725 per bag of one thousand; minimum grade is VG. Heritage Auctions will conduct a Signature Sale that is bursting with rarities sure to please advanced collectors as well as entice middle-range collectors. One of the highlights is sure to be the 1851 $50 Humbert Gold graded MS62 by NGC. This Lettered Edge and other Territorial Gold coins have been very popular over the years and are realizing substantial premiums of late. Also included in this sale is an 1854 O $20 Gold in NGC AU55. This coin has a population of only six in AU55 and just three in AU58. 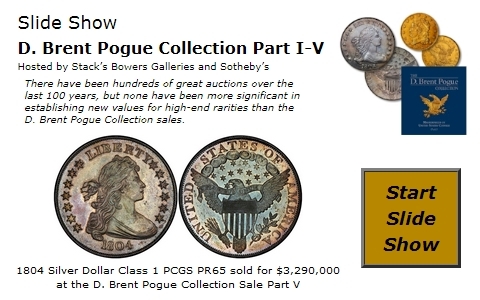 The current Market for the AU55 is $440,000 and one recently sold in a PCGS holder for $440,625. Listed below are a few other potential highlights from this Heritage Auction. The updated NumisMedia 500 is showing some nice increases for the most active coins over the last month. The 1864 S $10 Gold in VF20 jumped to $14,500 Market; that is up 38.10%. This is a very tough date with only 23 coins certified higher and none in Mint State. Also near the top is the 1857 $20 Gold in MS62; it climbed 30% to a new high of $13,650. 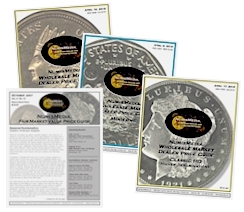 Below, we have selected a few coins from the NumisMedia 500 that have seen significant advances over the last month. Better dates and low populations are attracting many of today’s buyers. This trend has been ongoing for several years.